It’s finally fall, which means Thanksgiving is right around the corner. I’m not a big fan of Thanksgiving food, but I love the weather and the pretty fall leaves. I also love that we get to take extra time to spend with family and think about what we are thankful for. 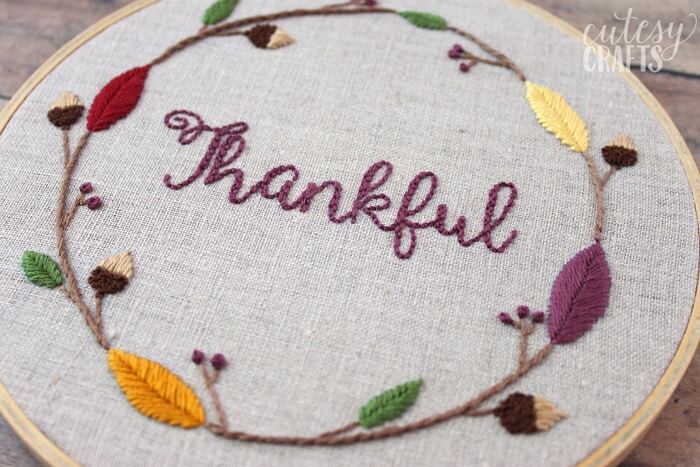 I created this pretty little Thanksgiving embroidery pattern for you to download. 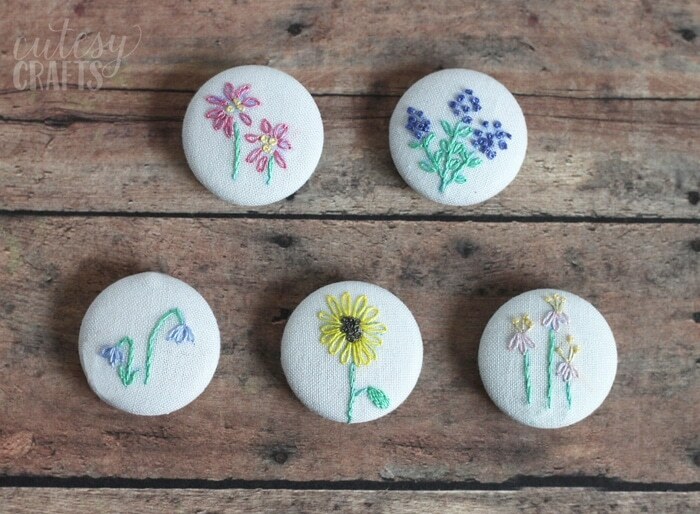 If you are new to embroidery, check out my How to Embroider for Beginners series. 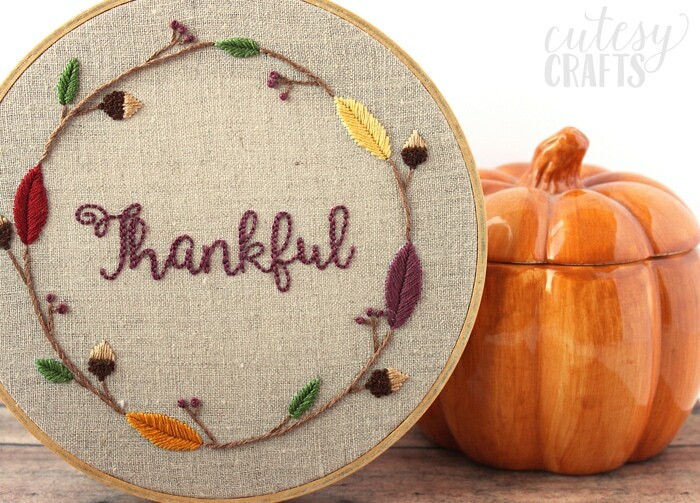 I designed this Thanksgiving embroidery pattern mostly because I wanted to try stitching up some acorns and brush up on my leaf-making skills. 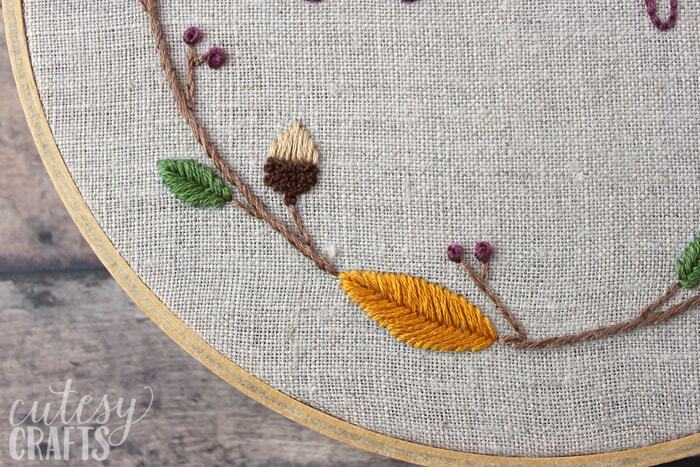 The acorns are made with little french knots and a satin stitch. The leaves are made using a fishbone stitch, and I love how they turned out! That stitch was a little tricky for me at first, but I think I’ve got it down now. The hardest part for me is always the lettering because I want it to look perfect. I used a small back stitch for the letters and made a second row of stitches on the thicker parts. I tried to offset the second row of stitches from the first row because I just think it looks better that way. There’s really no right or wrong way to do it. 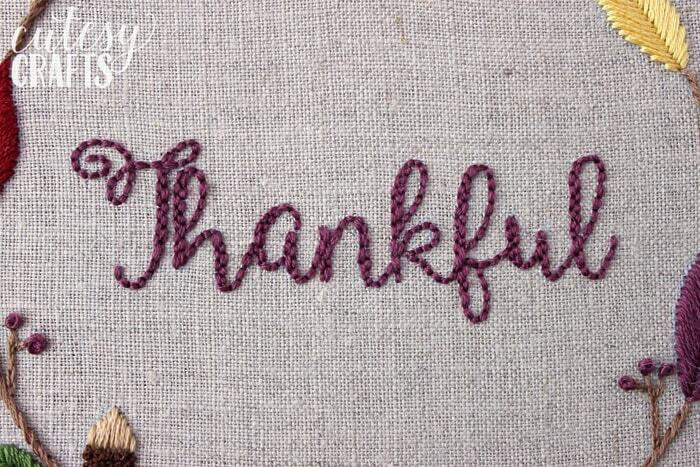 Look at my post on how to embroider letters by hand to see a video tutorial. The rest of the stitches are listed on the pattern. Check out my video here to learn how to back the hoop with felt when you are done. The perfect addition to my fall decor! 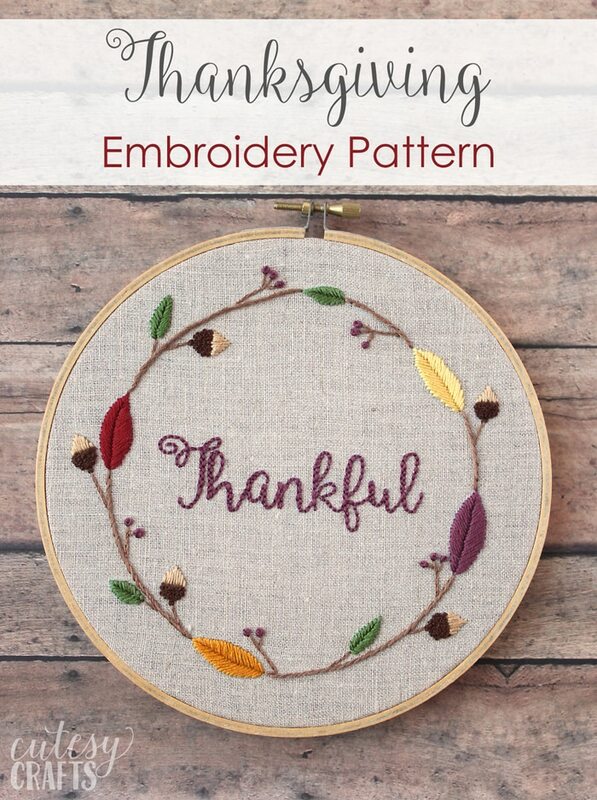 To download this free Thanksgiving embroidery pattern, enter your information in the form below or click here to subscribe to my newsletter. It’s free, and I’ll keep your email address safe. You can also unsubscribe at any time. 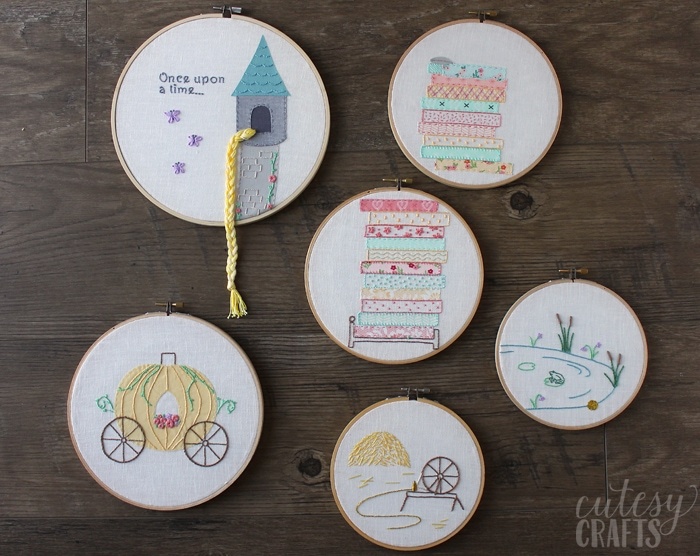 Check out the rest of my hand embroidery designs. I’ve got lots of free embroidery patterns for you to download. Thank you! 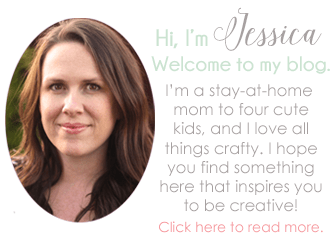 A gratitude journal is such a great idea! Such a nice way to keep a positive perspective on life. 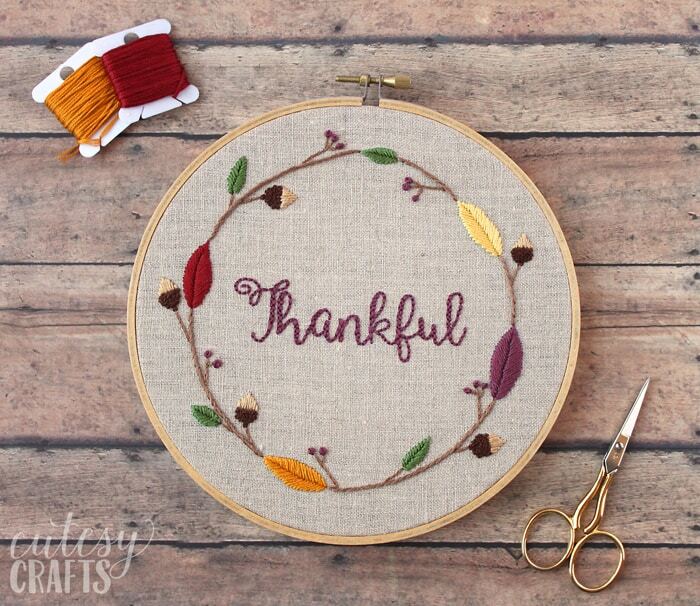 Thank you for sharing this lovely hoop pattern! I stitched it up this weekend, and it was so enjoyable! I did want to ask, where did you get your fabric? I can’t find anything like that at my local fabric shops. Also, do you have a good source for hoops? Sadly, Joann craft stores are me are not carrying pretty ones like you have here (with the gold hardware). I’m so glad you liked stitching it! The 100% linen I used for this hoop is actually from Joann. I really like stitching on a linen/cotton blend right now though. 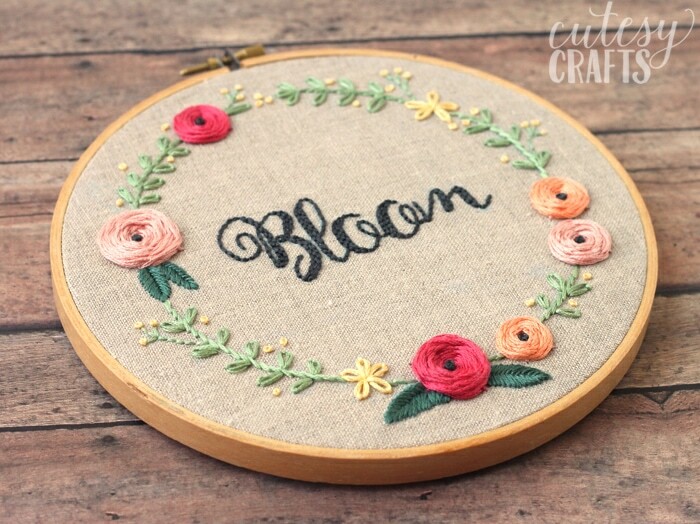 I wrote about fabric in this post: https://cutesycrafts.com/2018/07/best-embroidery-fabric.html. As far as hoops, I haven’t found a place that I love yet. I’ve been getting them from Joann and Michaels. I did pick up some from a thrift store a while back, so that might have been one from there. Thank you! That fabric post is helpful! I’ve been stitching on muslin, which is nice because it is very inexpensive. I checked out the linen selection at Joann and it is very small and expensive. I’ll have to look and see if they have any linen fat quarters in the store. I’ve also been wrapping my hoops with bias or twill tape to help hold the fabric (especially in the poor quality hoops I seem to be finding around here). Thank you so much for sharing your lovely and creative designs. I really love your style and look forward to more hoops in the future! Thanks Jess! I don’t think Joann has linen fat quarters, but you can always use a coupon and just purchase a small amount. That’s a good idea to wrap the hoops. I think I saw from another embroidery artist that they like the ones made in Taiwan vs China that Darice makes. Who knows? I’ll have to give them both a try and maybe write a post about it.